The most famous hat maker of Amlwch was David Edwards ‘Dafydd y Ffeltiwr’ (David the feltmaker),a hatter who was born and learnt his trade in Tre’r-ddôl, Cardigan shire around 1801. He moved to Amlwch in 1824 and is listed as a hatter in the 1828 trade directory. In the 1851 census he was listed as a hatmaker living at 11 Pigmarket Place. In 1861 he was living in market street with his wife Elizabeth. In the 1871 census he is listed as a widow at the hat shop market place. He died in Amlwch 29th September 1876. Felt hats had been made in Britain since the middle ages but become very popular in Wales in the early 1800 s. Fashionable ladies would wear tall felt hats to Chapel or market while miners used a felt hat adapted to hold a candle underground as described below. Jules Grunswick, Labour and the Poor in England and Wales 1849-51, to (London, 1983), 220. In Wales the felt hats were normally made from rabbit or hare fur. Around 2 ½ ounces of fur together with good quality wool was required to make each tall hat. The hair and the wool were drawn together on a hurdle and then, by using an implement similar to a bow, the fibres were spread in all directions while the dust and dirt fell through the holes in the hurdle. The fibres were then squeezed to form a cone, and the cone was then dipped into a large cauldron full of liquid known as a kettle. The liquid was a mixture of boiling water, a glass full of vitriol (sulphuric acid) and beer dregs or in some cases urine. The vitriol compressed the body of the hat and the beer or urine diminished the effect of the vitriol. The hatters would form the hat on a wooden plank on the rim of the cauldron, dipping the hat from time to time into the liquid. This process was known as planking. It was essential that the liquid be kept at boiling point. 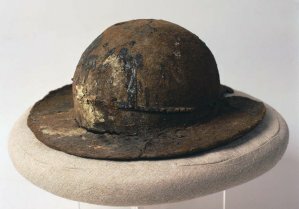 Once the hat had been shaped, it was dipped in varnish to make it waterproof, and once dry it was stretched over a hatter’s block to obtain the correct shape and then cut. It was now ready to be dyed. 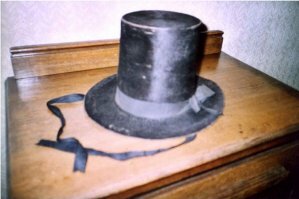 The hat was dipped in a black mixture, usually made up of logwood, copperas and nutgall. The finished hats were then dried in the open-air. Before being ironed by a heavy iron. A band was stitched on it and a suitable lining was added for the better hats.